The Zentai Phenomenon: A Serial Killer Digest, is so named because it was originally published as a series of postings from Oct. 14-Nov. 1, 2012. The series used a news clipping motif to “cover” the story in “real time” with the fictional events the story represents. Here, find the entire series in one posting. CHICAGO (PA News, Oct. 14, 2012) — The zentai phenomenon is literally covering the nation, as children, teens and young adults seek out — within increasing futility — the latest costume craze. A lack of supply is leading to extreme frustration by those trying to find the garb in the weeks leading up to Halloween. Zentai outfits are a cultural import from Asia and are a staple of the performance theater and cosplay, or costume-play, communities. The form-fitting full-body stockings are typically made in bright, solid colors from spandex-like materials. Melissa, a senior at Rockville High School and the cheer team captain, has been canvassing city costumers, seeking a maroon costume to match her school colors for next week’s homecoming game. Bob Cagney, of Cagney’s Costumes, said that while the costumes are just another fad, it’s one that has been profitable for him — to a point. Cagney indicated that his distributor for the zentai suits is Xeno Imports, a company apparently shrouded in mystery. Retail costumers like Cagney and others indicate that they’d never heard of or worked with Xeno before mid-summer, but now work exclusively with the firm for their zentai costume needs. Of the 22 costumers in the Chicago area that we spoke to for this story, each one reported that their relationship with the distributor started with a single complementary shipment of 6 suits — one in each primary rainbow color. Once the suits sold out — which normally happened the same day they were put out on the floor — a Xeno sales representative would show up and lock in follow-on orders — an easy prospect given their explosive popularity. “The suits are real cool,” said Dan Pulver, a Scare Shack manager, “and so are their reps. They glide in, tell you how many they think you need, tell you when you can expect them, and glide out. They don’t even want payment for the suits up front; they want them on purchase order only. They say they want happy retailers, and they know their products are going to move. It was working out great until the shipments slowed to a trickle. But the logistics slow-down isn’t limited to just the Scare Shack. All calls to the only phone number available for Xeno Imports went unanswered. Cagney said that’s a typical response from the company, which to his experience — an experience shared by all the other companies that we spoke with — only deal through their cadre of mysterious field representatives. Cagney said he worries that Xeno has nefarious intentions this Halloween season: that the company might be manipulating inventories to drive up demand — and prices. ROCKVILLE, Md. (PA News, Oct. 22, 2012) — The break-through material behind a Halloween costume fad that is sweeping the nation holds incredible promise for a variety of industries, including the military and medicine. The material in question is found in the colorful zentai full-body stocking costumes distributed by Xeno Imports. Beyond bright colors, a body-hugging fit and a full-body cut, no other zentai costume has the same characteristic material sought by leading researchers in a variety of fields. While the military itself is being coy about its research, the applications of which would capitalize on the features of the material, analysts told us that the Xeno material has a host of possible military applications. “We believe our armed forces are exploring the Zentai material for its potential in uniforms, from revolutionary new camouflage systems to lightweight body armor that can be integrated into regular uniforms instead of worn on top, where today’s systems weigh a soldier down and restrict movement,” said Tammy Johnson, senior analyst at the defense think tank PKI. Some had speculated that the mystery material originated in the defense arena and leaked into the commercial arena where it was quickly adopted by costumers, but Johnson refutes that. Indeed, it’s perhaps demand by global military powers that is driving demand and keeping costumers short-handed this Halloween season. Clinical researchers are also affecting supply and demand, by also exploring the possibilities of the cloth. Reed Hoskins, a medical research fellow at Witt Maltheau Memorial Hospital in Baltimore, is exploring the fabric as a proxy for human skin for use in medical grafts and for suturing surgical and non-surgical wounds. “It’s still early yet, but we’ve been able to show in a petri dish that natural skin accepts the Xeno graft,” said Hoskins. “This solution prevents taking natural skin from other parts of the body — which causes injury, risk of infection and disfigurement at that site. “If it works in clinical trials, our next step will be to ensure we have proper zentai colors on hand to prevent a burn victim from having a big purple patch on his face for the rest of his life,” he added. LOS ANGELES (PA News, Oct. 29, 2012) — Parkour athletes are jumping for joy — sometimes as high as 20 feet now — based on the increase in performance they say they’ve attained from zentai suits distributed by Xeno Imports. Parkour is a contemporary urban sport where young athletes maneuver across architectural obstacles — across, up and over walls or roofs, handrails or other city features, often in a race or in freestyle competition to see who can do the most extreme moves. Historically, this sport has been performed in urban wear, but for a group of South L.A. traceurs who are big on the international scene, the discovery of high-performance zentai suits has upped their skill and athletic capabilities, along with their style. Cho Li, a newer traceur with the High-Low Crew, introduced his mentors to the suits, and quickly demonstrated their performance potential. “Yeah, but now that we’ve all got the Xeno’s, you’re back at the back of the pack again,” interjected Danny, a more senior traceur, with affectionate good will toward the hodanna. “Seriously, though, we’re ALL better athletes for these zentai suits,” he added. With more than six years experience under his belt, or suit, Danny had already invented a small handful of freestyle tricks, including the whip jump and the wall walker. But the Xeno zentai suits, have allowed him to expand his creative powers. By his own report, and validated by a demonstration, Danny’s invented three new moves in the two weeks that he’s had his suit, including his new-now-signature ceiling climb, where he climbs up a wall and continues across a ceiling — perhaps across the underside of an overhang — and can tak at least three steps before losing grip and falling — or, most often, by reaching the other side. “I’ve always tried to push the edge of parkour, and if I’m not learning someone else’s badcan moves, I’m tangoing my own.,” he said. While the Xeno suits have already dramatically changed the sport in only a few weeks since they came on the scene, there are a few parkour purists who reject anything that alters the raw human skill and power that formerly was all that was present, and necessary, to compete. Ri-Sky, from cross-town Long Beach rival crew StreetKrabs, is one of those skeptics — or “haters,” according to Cho Li. As if to underscore his point, Ri-Sky jumped from the ground to the top of a six-foot wall, then back to the ground where he landed on his hands. Admittedly, it was an impressive moved — but based on this reporter’s research, the move begged the question: what might it have been like had Ri-Sky been wearing a Xeno? While the thrill of mastering incredibly difficult new athletic moves is its own high, athletes like Danny and Chi report that the Xeno suits give a high of their own; a subtle but everpresent peace and euphoria that is so pervasive that Danny no longer removes his Xeno. Who Isn’t Wearing Xeno This Halloween?! 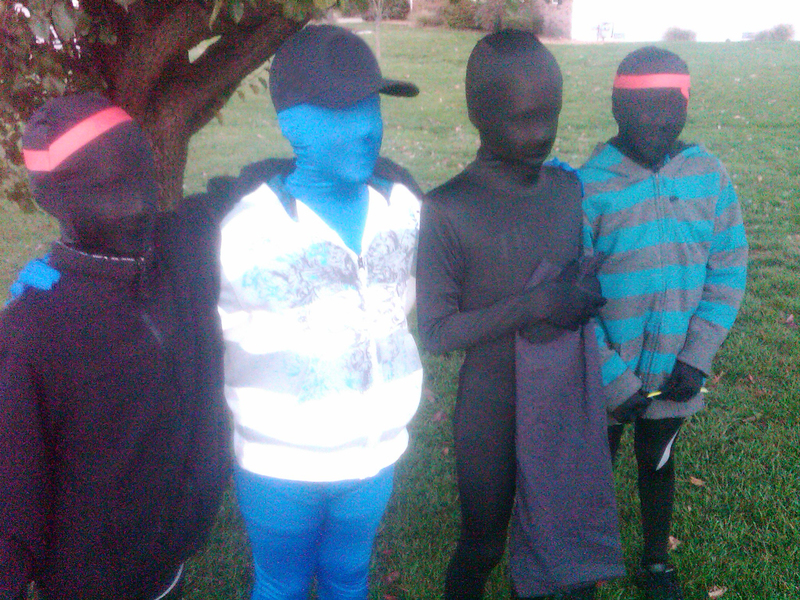 PORTLAND, Ore. (PA News, Nov. 1, 2012) — Millions of families around the world today are dealing with the aftermath of the too-true Halloween horror that’s being called the Zentai Phenomenon. While details remain sketchy, what is known at this time is that possibly 3 billion youth worldwide — between the ages of 6 and 18 according to officials — have disappeared from the planet. An entire generation gone overnight, seemingly bewitched into oblivion. Carruthers’ story is repeatable across every U.S. ZIP code and across both oceans. 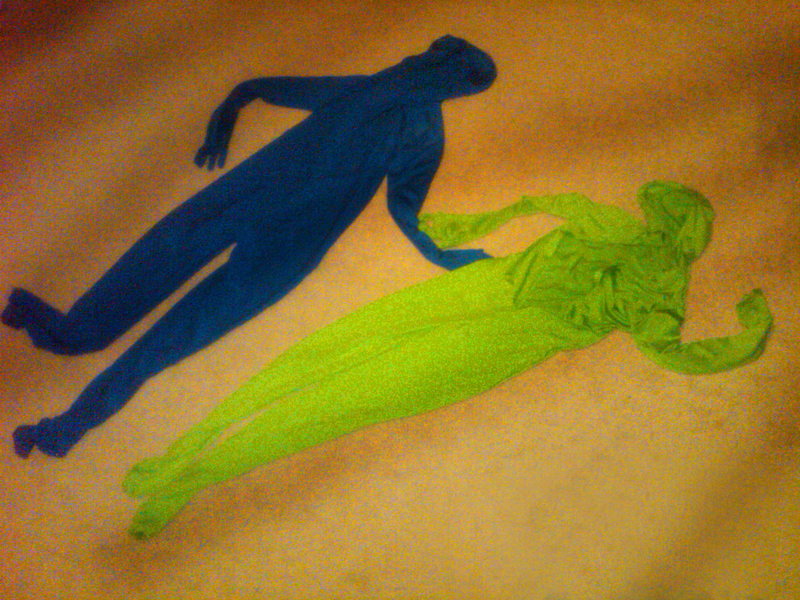 The only common element is that each missing child left behind a colorful zentai bodysuit costume. Witnesses report finding suits in the exact place and pose of their children the last time they were seen. Government officials are reluctant to go on the record to speculate about the world-wide incident, but one United Nations analyst divulged that all the suits involved in the case were sourced to Xeno Imports. The company, a mysterious global concern that emerged from nowhere mere months ago, has a large if shadowy sales and distribution force that catapulted the bodysuit craze onto the world trend scene just in time for Halloween 2012. Local officials were mum about events that transpired overnight, “under orders from the highest levels of our government,” said Sgt. Dan Hoskins of the Portland Police Department. The only other other official statement we could gather by our publication deadline came from Ross Hamilton, a father of two and an FBI agent, who validated a number of formal and informal complaints about Xeno Imports before his supervisor could drag him away. While government agents won’t yet speak to the situation on the record, there are others who will. Conspiracy theorists like Marc Adams generally don’t need a new “something” to get suspicious about; there are plenty of existing fringe notion ideas to pursue: in the history of Atlantis, in the Free Masons movement, at Area 51 and on the grassy knoll. But the Xeno suits threat has this small but vocal fringe community excited … and even scared. Adams, leader of the conspiracy theory bunking group Xnow (pronounced “know”) based here, said he has irrefutable proof that the Xeno suits are of alien origin and of nefarious intent. Adams wouldn’t — or couldn’t — answer where the aliens came from, how they got here and how they pulled off the heist; he also wouldn’t produce his Xeno rat, or even disclose whether the informant from the import company was human or alien. The lack of “hard” evidence for this reporter’s questions, however, didn’t stop the conspiracy theorist from stridently advocating his thesis. Reno Simmons, a professor of anthropology at the University of Santa Fe and a leading expert on conspiracy theories, said he initially doubted the claims about Xeno, and was actively working to debunk them for about a week when he made a discovery that, well, made his skin crawl. However, Simmons demurred when pressed to show this effect. “I don’t have the fabric anymore; it mysteriously disappeared the night that I tested it.” Unlike Adams, however, the scholar agreed to send additional evidence: video of the microscopic view of the fabric. Our independent review of the footage, conducted with some haste today with a forensics fabric expert and a coroner’s assistant, validated Simmons’ claim that the material is organic flesh, but decidedly not human. 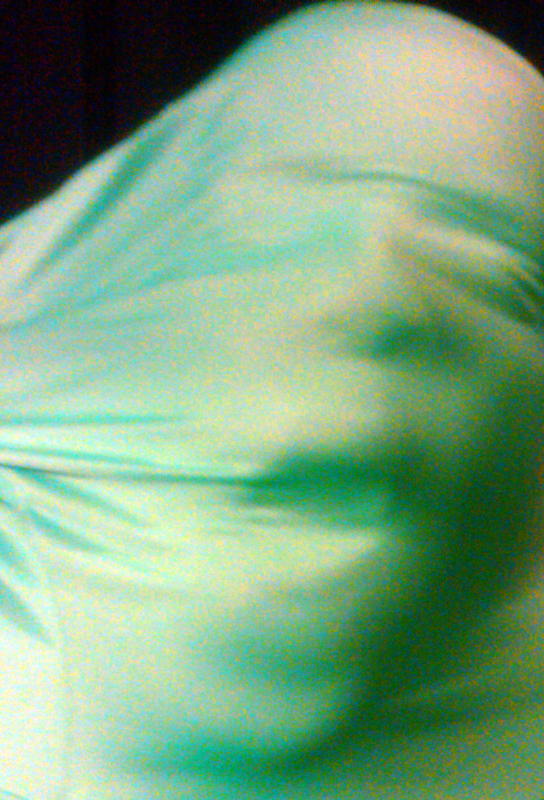 empty Xeno zentai suit, one prays that the children are o.k. wherever they are, while knowing inside that they can’t be. ~ by Random Handyman on November 3, 2012.